What’s Next for California’s Low Carbon Fuel Standard? On December 20, 2018, the Federal Energy Regulatory Commission (FERC) announced a Notice of Proposed Rule Making (NOPR) designed to simplify the horizontal market power analysis necessary for electric power sellers to secure market-based rate authority in some wholesale power markets. Specifically, the NOPR eliminates the need to perform two indicative screens (the pivotal supplier screen and the wholesale market share screen) in capacity markets and wholesale power markets already subject to Commission-approved monitoring and mitigation rules. Notably, the Southwest Power Pool and California Independent System Operator wholesale markets are not subject to these monitoring and mitigation rules, so parties seeking market-based rate authority to sell capacity in those markets must still perform the two indicative screens. This simplification will relieve the added procedural burden of administering the indicative screens for parties seeking market-based rate authority in the other FERC-regulated markets. The NOPR also proposes to remove the presumption that market monitoring or mitigation measures will adequately address indicative screen failures in organized wholesale power markets where the grid operator does not administer a capacity market. Rather, the NOPR proposes that in the event of an indicative screen failure in those markets, applicants submit a delivered-price test or other evidence demonstrating a lack of horizontal market power or that the applicant propose other mitigation for capacity sales in those markets. K&L Gates attorneys will continue to monitor these developments and assist our clients navigating compliance with FERC rules and regulations. K&L Gates is proud to sponsor the 2019 Infocast Renewable Energy Buyers’ Summit (REBA). REBA is an invitation-only event where renewable energy buyers gather to discuss renewable energy procurement best practices with their fellow corporate buyers, as well as get valuable insights from leading renewable energy experts. Teresa Hill will be moderating a panel on Latest Trends in PPA Terms and Structuring, and Bill Holmes will be moderating two panels, Assessing the Potential of Green Tariffs as a Renewable Sourcing Option, where attendees will assess the potential of green tariffs to provide a viable sourcing solution for renewable buyers, and Distributed Energy Solutions to Meet Corporate Goals, which will focus on on-site solar and energy storage. Please let us know if you will be in attendance! In September 2018, the California Air Resources Board (CARB) approved several significant changes to California’s Low Carbon Fuel Standard (LCFS) that will take affect on January 1, 2019. The LCFS is California’s “cap and trade” regime for transportation fuels, where fuels are assigned a Carbon Intensity (CI) that varies depending on their feedstock and how they are produced or manufactured. Producers of fuels with a CI under the annual cap (for 2018, 93.55 grams of CO2 equivalent per Megajoule) earn credits while producers of higher-carbon fuels like gasoline and diesel incur deficits and are required to buy offsetting credits to meet the annual average CI value. Credits are bought and sold in the secondary market, and the current LCFS credit price of nearly $200/Metric Ton is driving the development of many facilities that are able to produce transportation fuels with low CI scores. On December 13 and 14, 2018, the U.S. Department of the Interior’s Bureau of Ocean Energy Management (BOEM) conducted an auction for three offshore wind power parcels in Massachusetts. The auction not only broke the record  for number of companies bidding, but also for being the highest grossing offshore wind lease sale. The promotion of federal offshore land auctions and positive statements  from both the Secretary of the Interior and the acting head of BOEM suggest that the Trump Administration remains committed to developing U.S. offshore wind resources. A new federal tax incentive enacted in the 2017 tax reform package may provide a boost to many new facilities, repowering projects, and storage facilities. Qualified equipment could include a variety of energy and materials storage equipment, refining equipment, generating equipment, and extraction equipment. The Qualified Opportunity Zones (“QOZ”) incentive provides attractive tax benefits for investors with capital gains to invest in property and businesses located in geographic areas that are designated as QOZ. Recently released regulations provide significant clarity and highlight how valuable the QOZ incentive can be for qualified investments. See our October 23 alert for a discussion of how the proposed regulations answer many important questions that provide the certainty investors, developers, and entrepreneurs in the energy and infrastructure industries need to proceed with QOZ investments and projects. To view Version 3.0 of the Energy Storage Handbook, please click here. Energy Storage Handbook Now Available Online! We thank you for joining us at the 2nd Annual Energy Storage Conference. A special thank you to our co-sponsors, the Energy Storage Association and the Edison Electric Institute. We hope you enjoyed the day’s discussions. 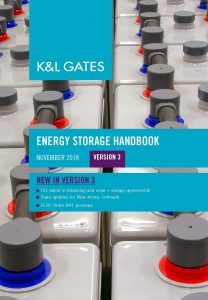 If you were unable to join us this year, we encourage you to check out the newest edition (Version 3.0) of our K&L Gates Energy Storage Handbook, available here. We look forward to having you join us again in the future. Across the energy industry, market participants have formed consortiums, and launched pilot programs testing blockchain-based use cases that could transform energy markets. State regulators, too, are engaging the industry on blockchain’s potential. 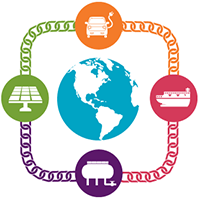 Every other week, the K&L Gates’ Blockchain Energizer will highlight emerging issues or stories relating to the use of blockchain technology in the energy space. To subscribe to the Blockchain Energizer newsletter, please click here. Shell and Other Oil Companies Test Blockchain-based Crude Oil Trading on Vakt. Energy Web Foundation Collaborates With Wirepas and Siemens. To view more information on theses topics in Volume 39 of the Blockchain Energizer, click here. On December 3, 2018, the Regional Transmission Organizations (RTOs) and Independent System Operators (ISOs) filed proposed market rule changes to provide energy storage resources with greater opportunities to participate in the wholesale markets as required by Federal Energy Regulatory Commission (FERC) Order No. 841. These widely anticipated FERC filings will likely provide the framework for how energy storage resources will be developed and used in the coming years. In February 2018, FERC released Order No. 841, which requires each regional grid operator to revise its tariff to establish a participation model that allows energy storage resources to participate in the organized wholesale markets and sell the relevant products offered by each market. K&L Gates covered the details of this Order in a blog post and in the Energy Storage Handbook. FERC set a deadline for each RTO/ISO to submit a compliance filing including tariff revisions by December 3, 2018. We have provided links to the compliance filings for each RTO/ISO below. The deadline for public comments on the filings is December 24, 2018 by 5 p.m. Each RTO/ISO has until December 3, 2019 to implement the changes. Considering the holiday season, some commenters may request an extension on this comment deadline. We will continue to monitor the development of these proceedings.